IS PREOPERATIVE ANGIOGRAPHY NECESSARY FOR DETERMINING CAROTID ENDARTERECTOMY (CEA) CANDIDATES? 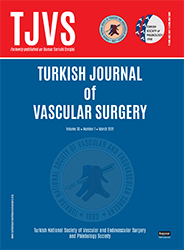 2İstanbul Üniversitesi Istanbul Tıp Fakültesi Radynloji Anabilim Dalı, İstanbul Purpose: The purpose of this study was to investigate the effectivity of Duplex sonography in determining carotid en-Orterectomy (CEA) candidates. Material and Methods: A total of 224 CEAs performed in 203 patients between May 1994 and December 1997 have been lncluded in this study. There were 49 (24.1%) female and 154 (75.9%) male patients with an age range of 43- '82 :mean:57.2 years). In the randomized group, 49 (21.9%) patients out of a total of 224 CEAs were operated upon with Duplex sonography findings only. Sonography and intracıperative findings have been compared in this group. Results: No morbidity related to stroke or death has been encountered in the group operated upon with Duplex sonography findings. Radiological and operative findings were similar in 48 (98%) eases. In only one case (2%) no pIague of hemodynamic sequela was found during surgery.